With the centenary of the Italian Futurist's first UK performance of the Art of Noises fast approaching, various rustlings are underway to commemorate the occasion. There are stirrings at Resonance 104.4FM: the expert engineer and sound designer Peter McKerrow is now working on some Futurist acoustic noise-intoners for an upcoming happening - the specifics still under wraps - but these replicas promise to boast some novel visual quirks that will see the 100-year-old acoustic noise-makers (that one reviewer in 1914 described as "sausage machines") brought "BANG" up to date (to use a Futurist noise effect). For this project I researched the original noise-intoner (intonarumori) patent to assist the construction, and also set myself a challenge of building a prototype entirely from found materials. But here I should skid to a halt. Tony Herrington recently wrote a great piece on The Wire website - "Turn that Noise down!" - drawing attention to the clumsiness of an excitable electronic music collective that has misrepresented Luigi Russolo's Art of Noises as being the birth of electronic music(!). Woefully, perspectives on Futurist music have been skewed by modern popular accounts erroneously lumping the Futurists in with early electronic developments. The Futurists did play some "electric" noise-intoners, *but* these only featured electric beaters to strike the strings - the soundstuff itself was purely mechanical, and bore no relation to any electronic instruments. Regarding my own electromagnetic rebuilding of a noise-intoner with electromagnetic resonators, I must stress that I am bastardising the original! The principles of electronic music were established in the early 19th century, but electric loudspeakers were not perfected until the early 20th century, so the early quiet experiments did not lend themselves to grand performance - remaining confined to the laboratory. It was the perfection of the electric loudspeaker that gave electronic music its "mouth" so to speak: giving the electrons a means to sing. In Britain, the earliest loudspeaker-derived electronic sounds were being dabbled with by the now overlooked electrical engineer Alfred Graham (1856-1929) - his work led to the apparent first UK performances of a prototype electronic instrument to junior scientific audiences at London's Royal Institution in late December 1895 and early 1896. 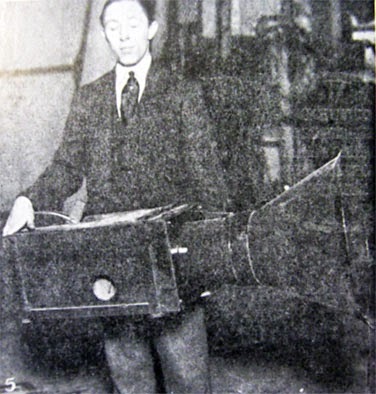 Alfred Graham was the founder of Alfred Graham & Company (continued by his son of the same name) who put their horn-like electric loudspeakers on the market in 1887. 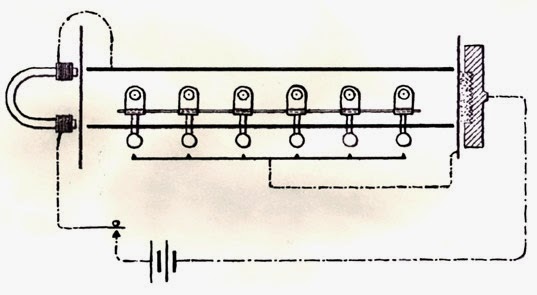 Graham, through his experiments in telephonic 'amplification', noted that when a carbon granule microphone was connected to a loudspeaker through a battery, and the microphone and speaker brought close together, a musical pitch would emerge - feedback. The circuit was simple: carbon microphone, loudspeaker horn and a battery (not forgetting a switch). 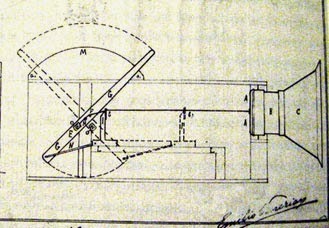 Alfred Graham patented the soundmaking technique in 1894, and also specified a possible musical application where the microphone and loudspeaker are acoustically joined through a pipe with holes cut in it. This alters the feedback's pitch by altering the resonance of the pipe. "The pitch, loudness or quality of the sound produced may be varied by varying the battery current in strength or changing its direction [polarity] or by changing the forms of the trumpets [loudspeaker horns] or varying the relative position of the instruments [the microphone and loudspeaker]"
Graham's technique was adopted as a showpiece by scientific lecturer John Gray McKendrick (1841-1926). McKendrick, as a physiologist, wanted to amplify the sounds of the human body. Such levels of amplification were hard to achieve (no electronic valves existed). 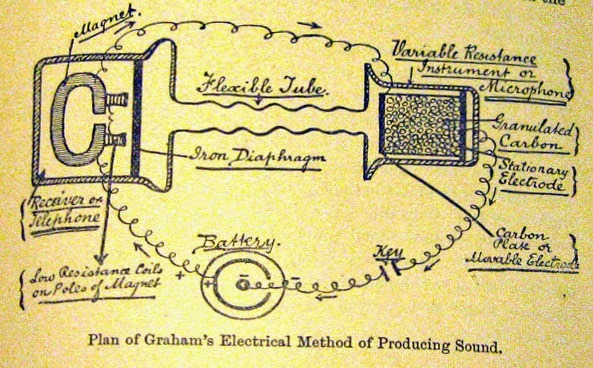 Inevitably, his experiments in pre-electronic amplification met with the extremities of self-oscillating feedback states described in Graham's patent. McKendrick found this particularly inspiring and wrote a short paper on it in 1896 titled "Note on Mr. Alfred Graham's Method of producing Sound by an Electrical Arrangement". 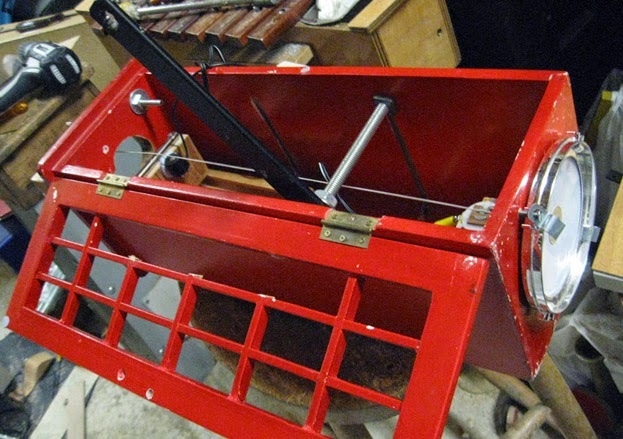 He enthused that the apparatus "suggests the possibility of constructing a new kind of musical instrument. Thus diaphragms might be tuned to the notes of the scale, and by pressing on keys, and thus completing circuits, musical notes having something of the quality of those of brass instruments might be produced. Possibly, also, by piercing holes at proper distances in the flexible tube, these holes might be so fingered as to produce different sounds, and thus we might have an electric flute." 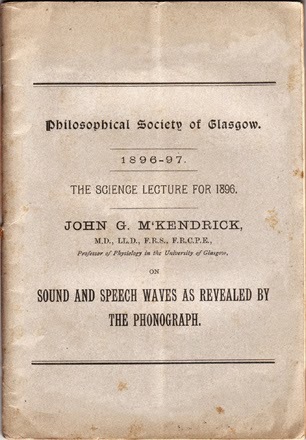 McKendrick exhibited the electronic sounds at the aforementioned 1895 Royal Institution lectures in London, where he presented a series of demonstrations for young audiences dealing with sound, hearing and speech. From what I can tell from limited information, he presented the tones unadorned - in a scientific manner - rather than demonstrating any adaptations to play musical ditties. This was intended to inspire the young audience about the possibilities of electrical sound production - a technique to be refined by a future generation. Loving your blog - fascinating reads and great links - thank you! Emitter of sounds and written wordstuffs. Instrument builder. 1/4 of Oscillatorial Binnage. Currently Resonance 104.4fm/Sound and Music Embedded Composer in Residence. Meadow House, Ashfordaisyak, etc. Lots of other stuff.